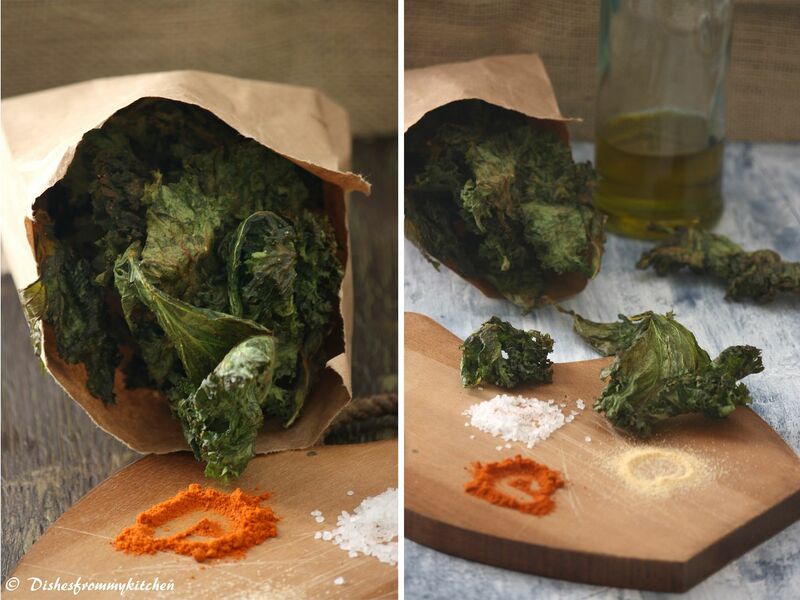 Dishesfrommykitchen: BAKED KALE CHIPS - MUNCH HEALTHY !!! 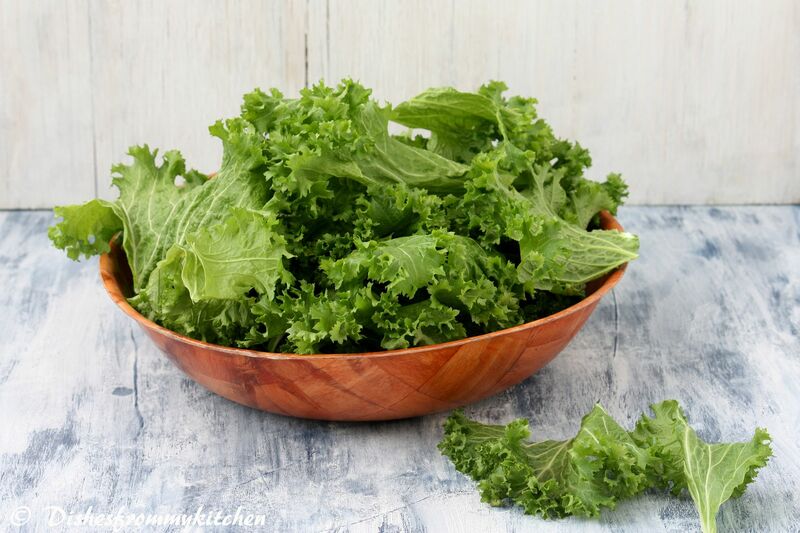 The beautiful leaves of the kale plant provide an earthy flavor and more nutritional value for fewer calories than almost any other food around. Like broccoli, cauliflower and collards; kale is a descendant of the wild cabbage, a plant thought to have originated in Asia. Kale can provide you with some special cholesterol-lowering benefits. Kale’s risk-lowering benefits for cancer have recently been extended to at least five different types of cancer. Kale is now recognized as providing comprehensive support for the body's detoxification system. We love kale in any form like sautéing, steaming etc. Munching Kale in the form of chips is another way of including them in your diet. I am sure you cannot stop at just eating one. There are umpteen number of ways you can flavor the kale. 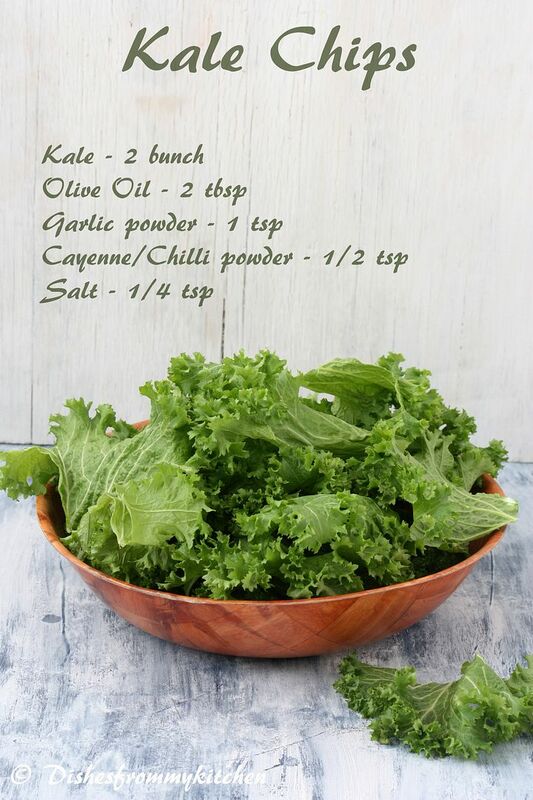 But here is a simple flavoring for Kale with spicy garlicky flavor. Hope you enjoy the healthy post!!! 1. Tear the leaves from the stem/stalk to big or bite size pieces. ( as it shrinks while baking). 2. 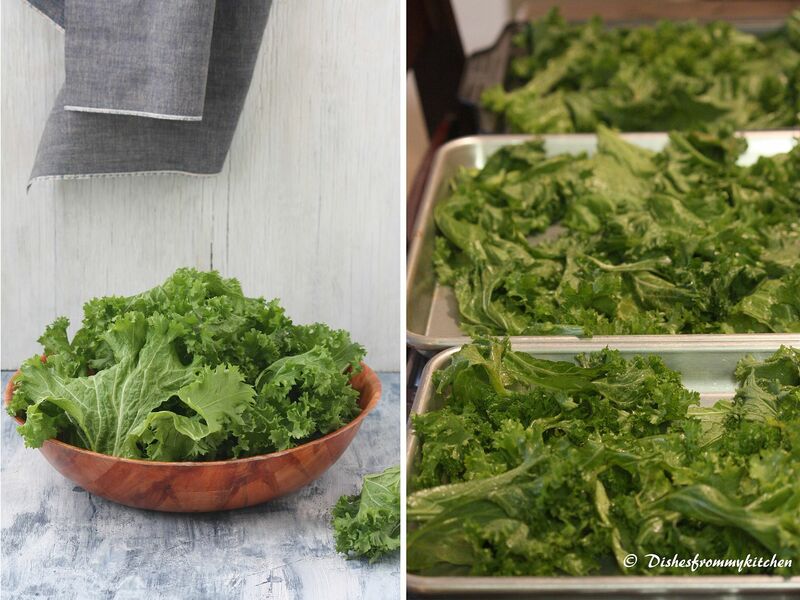 Rinse the kale in cold running water. Make sure there are no trace of mud or soil. 3. Dry them in the Kitchen towel. There should not be any moisture. 4. Then mix the garlic powder, salt and Garlic powder with the olive oil. 5. Now massage the Kale leaves with this mixture until they are well coated. 6. Spread the Kale in the baking tray. 7. 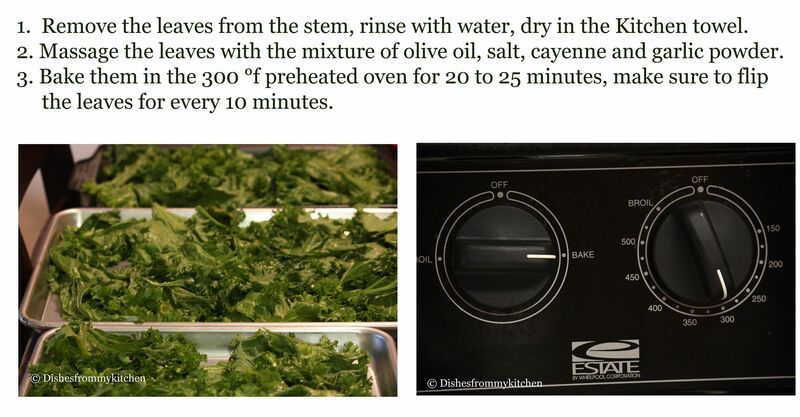 Bake them for 20 to 25 minutes in the 300f preheated oven, by flipping the Kale once every 10 minutes. 8. The time depends or varies in different oven. Let it bake until it is crispy and make sure the edges are slightly brown but not burnt. 1. 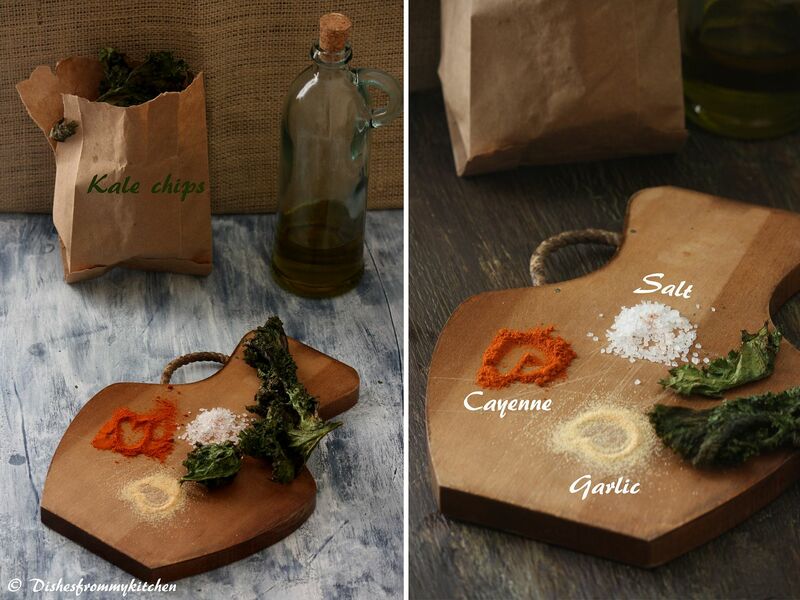 You can make chips with any type of Kale. The baking time depends on how thick the leaves are. 2. Play with your imagination by adding different flavors each time. This seems like the crackling Spinach they serve at Mainland China, but a lot healthier. Yum!! Love this Pavithra, I've always seen them fried and so never thought of making some myself. Baking is wonderful and love the garlic flavor that you've added! 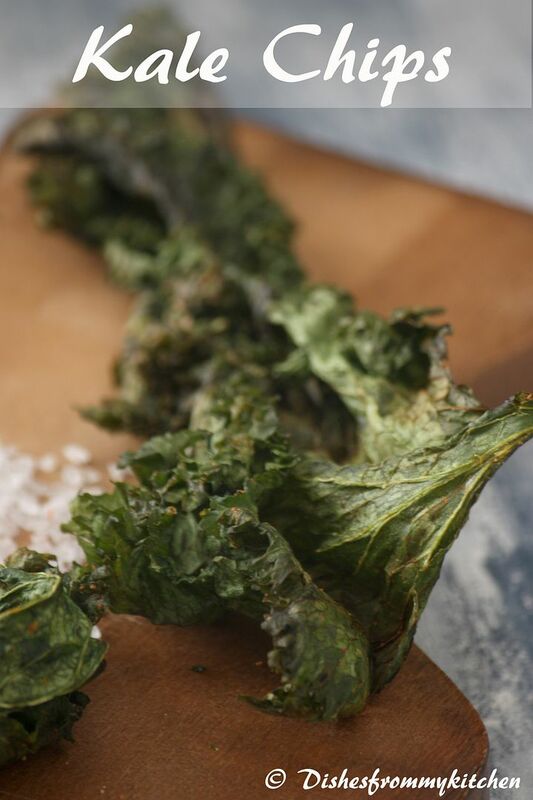 I've read about Kale chips on a number of blogs now and really want to try them. They sound gorgeous with that little hint of spice - the perfect healthy treat! Hi.. real nice way to include kale into our diet.. thanks for sharing. looks very crunchy munchy! this is new to me. interesting. looks so crunchy and nice pictres. nice healthy ones... love the clicks.. Very healthy one, will this work with spinach too? 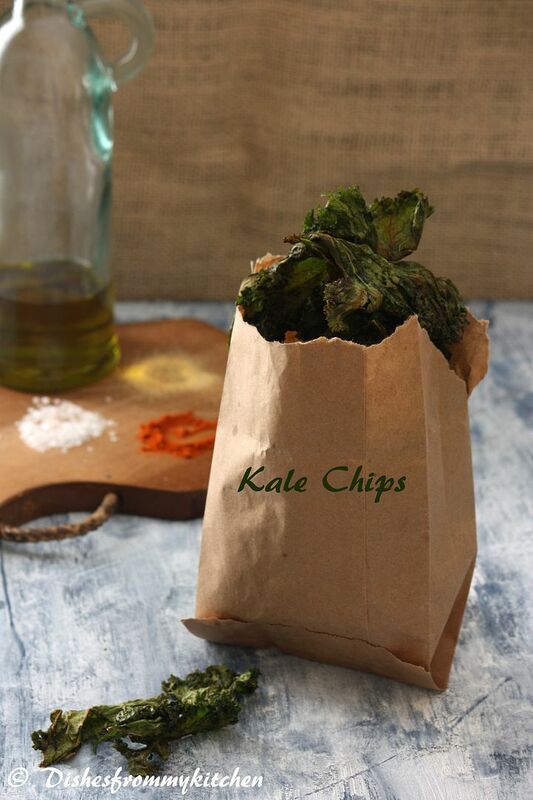 Simply superb and healthy kale chips to munch around pavi. I have been wanting to make these, thanks for sharing. Lovely chips !! Awesome clicks and loved the cutting board..
Light and crisp and healthy. I love spinach chips and I am sure kale will be really delicious too. Thanks! I recently discovered kale and kale chips! It's literally my new favorite snack! Love them! Really Pavi..kale ah kooda uttuvekkalaya neenga..how how..super! How long do these last? Can you store them for a later date or must they all be eaten right away?